Genuine OEM HP Toner Cartridge, Black, 2,500 page yield. HP part number: Q5949A, 49A. Laser Toner Cartridge compatible with HP LaserJet 1160, 1320, 3390, 3392. Remanufactured HP Toner Cartridge, Black, 2,500 page yield. Replaces HP part number: Q5949A, 49A. Laser Toner Cartridge compatible with HP LaserJet 1160, 1320, 3390, 3392. Remanufactured HP MICR Toner Cartridge, Black, 2,500 page yield. Replaces HP part number: Q5949A-micr. MICR Toner Cartridge compatible with HP LaserJet 1160, 1320, 3390, 3392. Remanufactured HP Toner Cartridge, Black, High Capacity 6,000 page yield. Replaces HP part number: Q5949X, 49X. 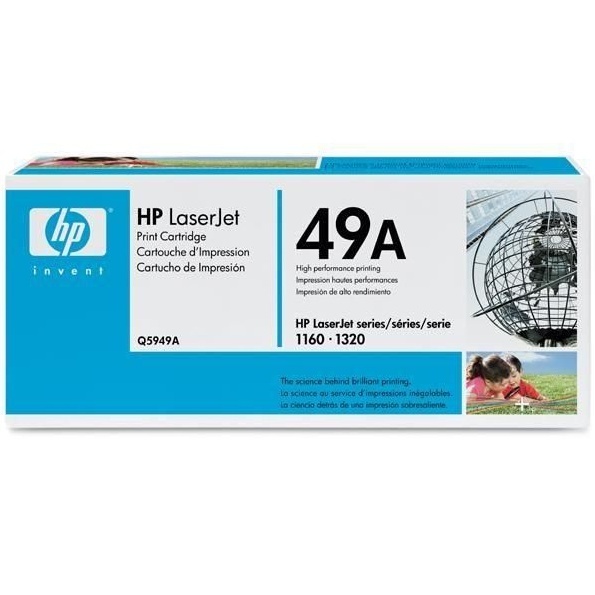 Laser Toner Cartridge compatible with HP LaserJet 1320, 3390, 3392. Compatible HP MICR Toner Cartridge, Black, High Capacity 6,000 page yield. Replaces HP part number: Q5949X-micr. MICR Toner Cartridge compatible with HP LaserJet 1320, 3390, 3392.